Is a peroxide mouthwash for porcelain veneers a good idea? IS THIS OK? I MADE MY OWN MOUTH WASH: 8 OZ FILTERED AND BOILED WATER, 8 OZ OF 3% HYDROGEN PEROXIDE, 2 TBS SEA SALT. I HAVE PORCELAIN VEENERS ON MY TEETH. Well, at least you aren’t using a mouthwash with alcohol. That would soften the bonding agent used to bond the porcelain veneers which will cause ditching and staining around the edges. But the mouthwash you are mixing up at home will cause other problems. The active ingredient in the formula you gave me is the hydrogen peroxide. Hydrogen peroxide will kill a number of micro-organisms. Many of the bacteria that contribute to gum disease are what we call anaerobic—they thrive without the presence of oxygen and, in fact, oxygen will kill them. Hydrogen peroxide, when you rinse with it, bubbles and releases oxygen, killing these harmful bacteria. However, the peroxide will also kill many beneficial microbes that live in your mouth, which causes other oral micro-organisms to thrive because of the absence of competition. One of these micro-organisms is the yeast, candida albicans. The result of all this is that occasional or short-term use of hydrogen peroxide as a mouthwash can be very helpful. But if you use it steadily for a period of, say, two weeks, you will end up with an oral yeast infection because the candida albicans will grow without restraint. In an oral yeast infection, the mucosal surfaces in your mouth turn white and peel, leaving raw, red, and painful patches. There are a number of alcohol-free mouthwashes that you could use to help you care for your porcelain veneers, if you want to use a mouthwash. Check the link for more information about that. But my advice is that if you brush and floss faithfully and correctly, any need for a mouthwash would be minimal at best. What mouthwash should I use for my porcelain veneers? I need to know what is the best mouthwash to use that won’t damage my veneers? maintain them with good hygiene. I never recommended mouthwash for any of my patients after receiving cosmetic dental work. I’m not sure why you feel you need mouthwash. The basics for maintaining a set of porcelain veneers is keeping the teeth clean. You want to brush and floss, and have regular dental cleanings. And in doing so, I would avoid highly abrasive cleaning agents, like abrasive toothpastes and any abrasive cleaning techniques by your dental hygienist (pumice-containing polishing agents, or power polishing equipment). Mouthwash doesn’t really contribute to this regimen. Now mouthwash may not hurt anything. Check the ingredients. Most mouthwashes contain some type of alcohol. This will soften the bonding composite that was used to bond your veneers to your teeth. So that’s a big no-no. For example, you’ll see on the label that Listerine contains 21.6% alcohol. That spells trouble for porcelain veneers. 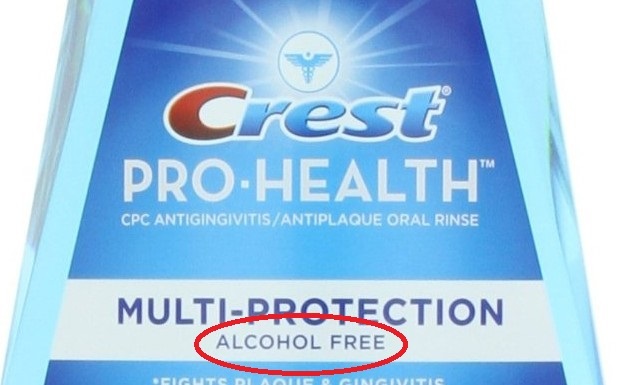 Crest Pro-Health, on the other hand, is alcohol-free, and is plainly labeled that way. So that one won’t hurt anything and you could go ahead and use it. 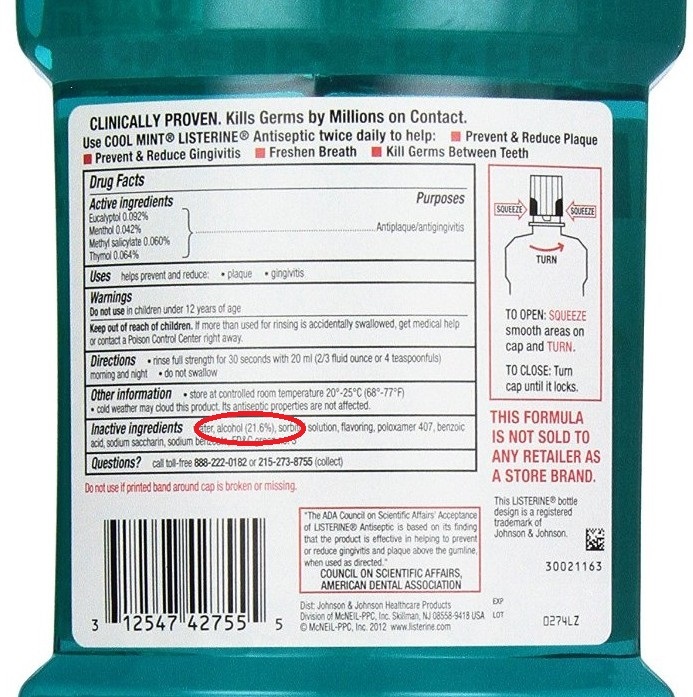 Breath Rx mouthwash for bad breath is also plainly labeled as alcohol-free, and would be safe to use. Breath Rx was developed by a prominent Beverly Hills cosmetic dentist who is sensitive to this issue of not damaging cosmetic dental work. See my pages on tips for maintaining porcelain veneers and other cosmetic dental work. Is the Cavitron safe for use with porcelain veneers? Yes, the Cavitron is an ultrasonic scaler, and in my advice for care of porcelain veneers I have written a caution about that, that an ultrasonic scaler can chip the margins of porcelain veneers. It’s not the water that is the cause for concern, but the metal tip that vibrates at an ultrasonic frequency. But thanks to your bringing this to my attention, I have gone over this advice to update it. After some additional years of experience with these machines, I’m going to soften that advice somewhat. Ultrasonic scalers like the Cavitron have gotten very popular with dental hygienists and I believe that most quality offices are now using them. I believe that if hygienists are skillful in using them, are smooth in their motions and don’t dwell on the margin area, that they are fine. So where I used to list ultrasonic scalers as unsafe to use with porcelain veneers I’m going to say now that in the hands of a good hygienist you should be fine. These ultrasonic scalers are powerful and they not only have the potential to nick the margins of porcelain restorations, but they can nick the cementum of teeth, causing a roughness that will attract plaque and calculus. But I have had the opportunity to observe closely in the past few years at three dental offices where the hygienists have used ultrasonic scalers, and they have all been excellent with them, to where I really don’t think there is a risk of damaging the porcelain. The two absolute no-no for dental hygienists in maintaining porcelain veneers are no Prophy Jet and no acidulated fluoride treatments. The Prophy Jet sprays an abrasive at the teeth at high pressure and it will destroy the glaze on porcelain veneers. This isn’t a risk, it’s a certainty. And acidulated fluoride will etch the surface of the veneers causing similar though milder damage. This is a final follow-up to a correspondence with Aaron from Indiana. I went to my cosmetic dentist and had another e.max crown placed and was prepped for another one on my right lower side. The crown looks great and I am highly satisfied with my lower left molar restoration. I also had a polish and the luster on my cosmetics has been restored. I have been using Supersmile for 4 days. My teeth look so amazing and I love the Supersmile product. After using the toothpaste, I went ahead and ordered a tube of the accelerator. In conjunction with the at home Zoom treatments, I think the Supersmile products will get the shade on my lower teeth where I want it to be and with less sensitivity. The low abrasion factor and the calprox are big selling factors for me maintaining my new super smile. Do porcelain veneers lose their shine that quickly? A couple of days ago I posted a question from Aaron in Indiana. He had a smile makeover that he said had lost its shine. I invited him to give me more information, because ordinarily porcelain veneers will not lose their shine unless they are abused by a dental hygienist with a Prophy Jet power polisher, or a fluoride treatment with acidulated fluoride. Both of these will remove the glaze on porcelain veneers. He responded by describing his treatment to me, and enclosed a photograph of the work the way it looks now. Yes, it was porcelain crowns and porcelain veneers. And he confessed to having obsessive-compulsive tendencies. Yes, I would say obsessive-compulsive here. These teeth still have their shine. The glaze is still there and they look fine. To me it looks like a normal luster on the porcelain – the glaze is still there. There may be some polishing that could be done, but myself, I wouldn’t touch it. Nothing on porcelain is as good as the natural glaze. Porcelain polishes, because porcelain is so hard, have to be a diamond paste, and a polished porcelain surface to me is second best to the original glaze. See Aaron’s reply. His dentist polished the veneers some, and he tried Supersmile toothpaste and loves it. After 2 months, my smile makeover is losing its luster. What is going wrong? I just had a cosmetic total upper smile make over from a very credible cosmetic dentist. 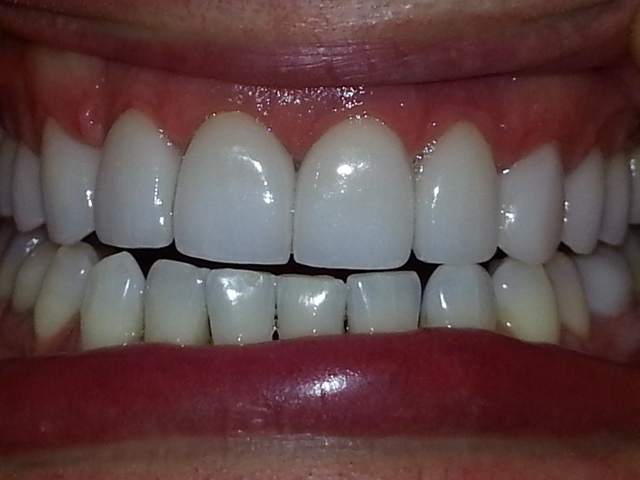 I am in love with the results and have been caring for my new smile better than I would my natural teeth. It was a HUGE investment, so one has to be particularly attentive. I am currently brushing with Crest 3D Glamorous white toothpaste, as it was the best toothpaste at the drug store and rinsing with Listerine whitening 6 in one with fluoride. I’ve noticed that the pearly luminescent white sheen is now significantly diminished in just over 2 months from the reconstruction. I read online that a mild baking soda paste could restore the sheen. That was tried with no success. Could my toothpaste be the problem and can the nice sheen be restored by my dentist? Will Supersmile toothpaste restore the sheen at home? And if not will it preserve the sheen if my dentist can restore the luster in office? I have an appointment with my cosmetic dentist next week and intend to ask her the same questions. Hopefully, you can reply so I am fully educated before my visit next week. I really enjoyed reading your website. Thank you for your time and consideration. There are two possible reasons for a loss in luster of a smile makeover within only two months. I don’t have enough information to tell you which of these is the case. If you can give me more information about exactly what was done, what material was used, and about the dentist who did them, I could tell you. Porcelain itself is extremely hard, harder than tooth enamel, and it would take a pretty potent abrasive to dull its shine. Toothpaste alone wouldn’t do it. Power polishing equipment (such as the Prophy Jet) that is used by some dental hygienists will take away the glaze and cause the porcelain to go dull. Another thing a dental hygienist can do is to give you a fluoride treatment with acidulated fluoride. This form of fluoride has hydrofluoric acid in it, which will etch porcelain, dulling the surface and making it susceptible to stain. The other cause of a loss in luster of a smile makeover would be that the makeover is not porcelain but composite. Composite isn’t nearly as hard as porcelain and is softer than tooth structure. A number of things can dull the shine of composite, including a toothpaste that is too abrasive, or ordinary polishing pumice used by most dental hygienists. Besides that, your mouthwash, the Listerine Whitening 6 in 1 with Fluoride, has alcohol in it. Alcohol will soften the composite so that it is even more susceptible to scratching and staining. I’d skip the mouthwash – most mouthwashes have alcohol in them. The abrasive toothpaste will not scratch the porcelain – the porcelain surface is too hard. What it does is scratch and wear away the bonding composite that bonds the porcelain to the tooth. That bonding composite forms a very thin line around the entire veneer – it will vary a lot with the technique of the dentist and the ceramist, but it might be, say, 100-200 microns which would be about the thickness of three to five hairs. So if you have been using the abrasive toothpaste for only two months, you probably won’t notice anything yet. When that bonding composite is scratched, it might pick up stain more and what you would see would be a line of stain around the veneer. And then the other problem with the abrasive toothpaste is that it wears away that composite so that you would form a tiny, almost microscopic “ditch” around the veneer which would be an attraction for plaque and a vulnerability where decay could attack. It’s just a prudent maintenance thing to use the Supersmile toothpaste on expensive cosmetic work – kind of like changing your oil in your car. You aren’t going to ruin your car because you went 1000 miles over the limit before changing the oil one time. Just get on the regular, sensible maintenance with the Supersmile toothpaste from here on out and you should be fine. Now if you had direct composite bonding on your teeth, that would be a different story. The composite, like the bonding composite between the porcelain and your tooth, is a softer material and the shine can dull easily. But your expert cosmetic dentist should be able to re-polish the bonding and restore the shine. I have four porcelain veneers on upper teeth, that have stayed color stable, etc However after a cleaning last year, I am seeing a small gray stain forming on top of one at margin I don’t know if it was damaged but find it interesting given correlation in time I do go to a highly respected cosmetic dentist and staff is trained to maintain veneers etc Is there a way to clean margin and remove the stain? I’m at a disadvantage in not being able to see this stain you’re talking about, so I’m going to take a guess at what it looks like. And I don’t know how old they are. Porcelain veneers have the characteristic of being very stain resistant – even more stain-resistant than natural teeth. And, as you said, they are also very color stable. When they do stain, it is usually from one of two causes. Either the surface of the porcelain veneer has been damaged – the glaze has been broken possibly due to the use of power polishing equipment or acid fluorides. Or, there is something getting under the veneers. For the sake of being able to say something, let’s assume that these are older veneers that have been on maybe ten or twenty years, and that the stain starts right at the edge of the porcelain veneer and involves the first millimeter or two of the veneer. This is the type of stain that would be the most likely to confine itself to the edge of the veneer. If this is the case, you would not be able to have this stain polished out. The veneer would have to be removed and replaced. And it wouldn’t be related to any damage that could have been done during your cleaning. Links: read more about stained teeth. You are so kind and wonderful for answering my question so thoroughly. May I ask you another? Will (or can) the ultrasonic (Emmi-Dent 6) is what we purchased – affect craze lines or a fractured tooth? I always hear that windshields that have a crack will spread from vibrations while driving and was curious if vibrations from this brush make the craze lines or crack worse. Thank you. You’re a very kind man. No, the Emmi-dent is actually an ultrasonic toothbrush, so it’s different from the sonic ones we mention. But it is also safe for all dental work and for your teeth. When a windshield crack spreads, it is the windshield that is vibrating. A soft-bristled toothbrush vibrating on the surface of the tooth doesn’t hurt it at all – it only polishes it. Click here to read more about the Supersmile Advanced Sonic Pulse toothbrush, which was developed to be an aid in maintaining porcelain veneers, dental bonding, and other cosmetic dental treatments. I’m confused. Your site says not to use ultrasonic cleaning devices for bonded teeth, yet you’re selling an ultrasonic toothbrush. Please respond accurately with factual information – does ultrasonic toothbrushes cause any harm to dental restoration – not just abrasion, but do the vibration cause a loosening of the bond (over time or otherwise). Please explain. Thanks for your question. I looked on the website to see where this confusion might be coming from, and I see where it is put in a fuzzy way and confusing. I have gone back to clarify a couple of the pages and hopefully that will help. When I tell people not to let a dental hygienist use ultrasonic cleaning devices on their bonded teeth, I am referring to equipment like the Cavitron that has a metal tip that vibrates at ultrasonic speeds. This metal tip can nick the margins of bonding and also of porcelain veneers. In several places on the site I reference these as ultrasonic scalers, but in one place I call them ultrasonic cleaning devices. That’s too broad a term, and I’ve corrected that instance to make it clear I am talking about these ultrasonic scalers. There are two differences in trying to apply this concept to toothbrushes. The first is that the bristles of these electric toothbrushes are soft and so are incapable of nicking anything solid like dental bonding or porcelain veneers. Rather, they clean and polish, which is a beneficial result. And the second is that the toothbrushes are almost always “sonic” toothbrushes, not “ultrasonic”, which means that they vibrate at slower sonic speeds, which also makes them more gentle. And there is a dentist who has posted something on the Internet claiming that sonic toothbrushes loosen dental bonding. However, this is without any factual basis. He is the only one saying this, and, in fact, the University of Missouri at Kansas City did a study they published in 1998 which proves that this is a fallacy. They brushed teeth for two years with a sonic toothbrush and could not find any weakening of bond strength. This confirms my own observations. And don’t misinterpret this to be a condemnation of ultrasonic scalers in the hands of a skilled dental hygienist. While they can be misused and can nick the root surfaces of teeth, when used properly they are a great aid and produce a superior result. My dental hygienist uses this every time I come in for a cleaning, and it leaves my tooth surfaces smooth and spotless.